Making steamed mixed veggies is quick and easy. 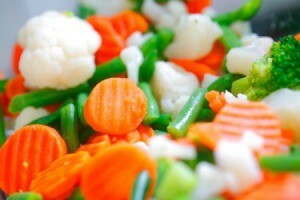 This is a guide about making steamed mixed veggies. Do you have just a few carrots, potatoes, string beans, onions, etc. but not enough to make a batch of each one individually? Using a steamer place the heavier veggies in first (i.e., potatoes) steam them for about 5 minutes remembering to fill the pan underneath the steamer with water and then add the remainder of the veggies. Continue cooking for about 5 more minutes. I check a veggies to make sure it's cooked enough. Serve with lemon butter. Oh, so delicious. Happy eating.